Ansoumane Doumbouya, the former Guinea CITES official arrested recently in Conakry for wildlife trafficking using fraudulent CITES permits, also signed permits for the export of bonobos to Armenia in 2011. No bonobos live in West Africa, they are restricted to the Democratic Republic of Congo. Ofir Drori of EAGLE reports that Doumbouya has been transported to prison to be held for trial. An unsigned blank CITES permit was found in his bag! The following story published in an Armenian newspaper gives some background and links to earlier stories about great ape imports to Armenia. Ansoumane Doumbouya, former head of the CITES Management Authority of Guinea and a key player behind the illegal export of hundreds of chimpanzees and gorillas to China and elsewhere, was arrested on August 21. EAGLE (Eco Activists for Governance & Law Enforcement) announced the arrest of Ansoumane Doumbouya, along with the infamous wildlife trafficker Thierno Barry, in Conakry, Guinea’s capital. 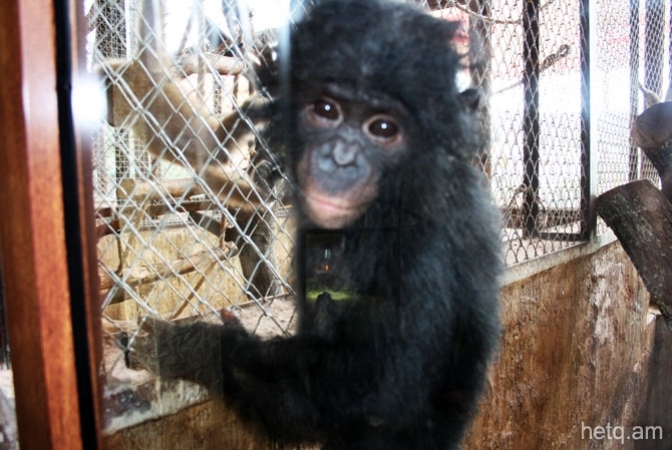 Hetq has the following CITES export permit, signed by Doumbouya in 2011, under which two bonobo primates were imported by the Zoo Fauna Art company in Armenia. A Hetq investigative series into the illegal animal trade in Armenia led to criminal charges against Zoo Fauna Art owner Artur Khachatryan. The investigative division of Armenia’s Ministry of Finance has been dragging out an inquiry into the matter for one and a half years. Even after he lost his position with CITES, Doumbouya retained a position within the Guinean Ministry of Environment as Commander of the national wildlife and forestry mobile enforcement brigade and was still signing CITES permits for traffickers. 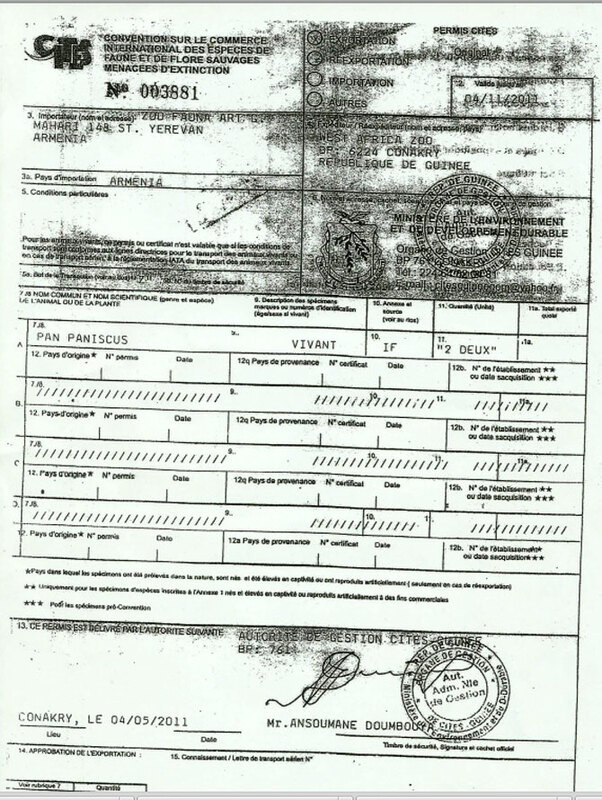 This entry was posted in CITES, Guinea, trafficking and tagged Armenia, CITES, Guinea, trafficking. Bookmark the permalink.